It's natural to talk genealogy at family gatherings. But if you don't want to bore your relatives who aren't as into genealogy as you are, you have to go into it with a strategy. 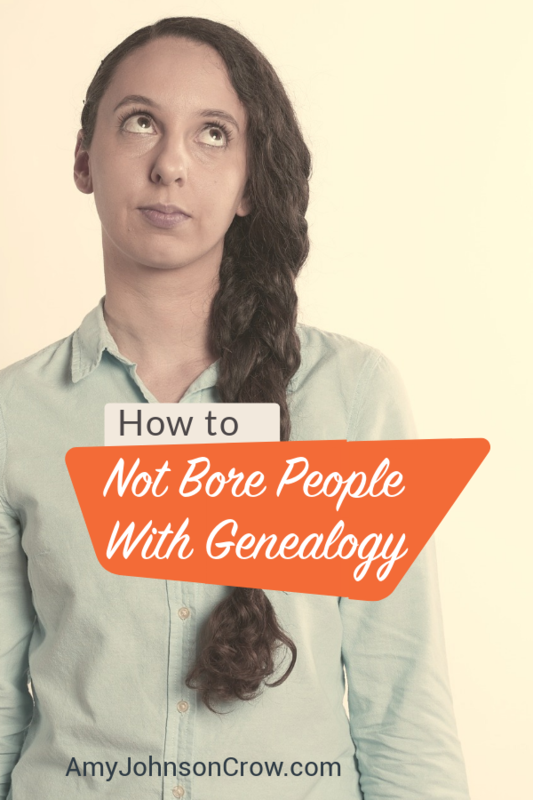 Here are some ways to NOT bore people with your genealogy. While they say it sort of jokingly, there is often some truth to it. And that's a problem. What’s more, it’s a problem that we often bring on ourselves. 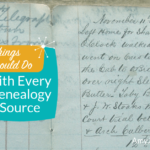 If your relatives would rather wash all of the holiday dishes than listen when you’re talking about genealogy, you might want to re-think how you’re talking about genealogy. Time for a little tough love here. Be honest with yourself. When you’re talking about family history, are you talking about the stories of your ancestors or are you talking about your research? For someone who isn’t doing genealogy, hearing the trials and tribulations of solving a research problem isn’t all that interesting. When the only stories we tell are about our research process and how difficult it is, it’s easy for non-genealogists to tune us out. Just because someone isn’t interested in the process, doesn’t mean that they aren’t interested in the end result… in the stories that we find. It’s kind of like quilts. There are people who love to quilt. There are also people who love quilts, but have no desire to make one. Just because someone doesn’t want to make a quilt doesn’t mean that he or she doesn’t like them. Just because someone isn’t interested in the research process doesn’t mean that he or she isn’t interested in what you’ve discovered. One of the first rules of storytelling is “know your audience.” What would resonate with that person? 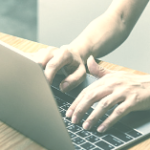 Fit your stories to the audience. Are you going to be seeing Aunt Karen who loves to travel? 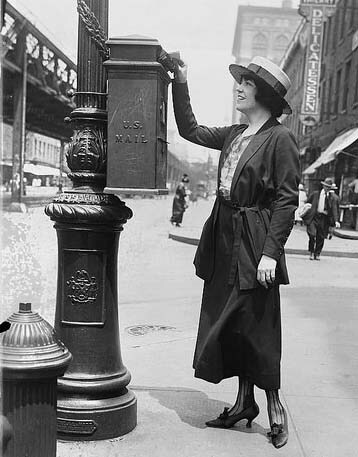 Show her pictures of your ancestor’s homeland. Do you have a niece who’s getting married soon? Show her the marriage register for your Quaker ancestors and how everyone at the meeting signed as witnesses. Then you can compare how weddings today are different than weddings back then. Remember, too, that you don’t have to tell an ancestor’s whole life story. Think about biographies that you’ve read or watched. An excellent movie that came out a few years ago was Lincoln with Daniel Day-Lewis. The movie didn’t cover Abraham Lincoln’s entire life. It focused on one specific period when he was president. Think about doing the same with your ancestors. Instead of trying to tell an entire life story over dinner, pull out individual stories. Let’s say you have a Civil War ancestor. Instead of telling everything about him from his birth to his death, tell about how he was in the hospital with measles for two months. Tell about how hard it was for the widow of your Revolutionary War veteran to receive her pension. Show the photos you’ve found of people and places. If you want to show documents, show ones that are easily explained and easily understood. A 102-page Civil War pension file isn't easily explained. An ad for great-grandpa's general store that you found in a city directory is. There’s also another way to not bore people with your genealogy. Make them a part of it. Take the opportunity at family gatherings to gather stories. Pull out the photo album. It doesn’t even need to be photos of people from the 1860s and 70s. Pull out the photos from the 1960s and 70s! Get people talking. Remember -- you are a part of your family history. So it’s important to record your memories and stories, as well as others in your generation. Make some old family recipes and share those recipes with other family members. Explain why the mashed potatoes are always served in the blue bowl that doesn’t match anything else. The key to not boring people with your genealogy is to remember that not everyone is interested in the research process. But most people love a good story. Our ancestors provide plenty of stories. It’s up to us to share them. 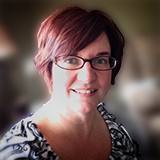 This entry was posted in Musings, Podcast and tagged Generations Cafe by Amy Johnson Crow. Bookmark the permalink. Thank you so very much for re-emphasizing the main reason for genealogy-to tell the family’s history, to tell their story and to tell your own so that future generations can learn about thier ancestor from that person’s own words. . History is oral first and only latter written. Perhaps the best suggestion you have given is to have others join in the conversation with thier own insights and their own stories. Invitations to join in a conversation encourage others to do so and add to the common thread of the fabric of a family. Thanks again. I totally agree with your comments. My teen kids are filled with compassion for and mirth over our ancestor who, from a old newspaper clip, we can see got a liquor permit and opened a bar in New Orleans, only weeks before Prohibition! So unlucky for him! Now they also understand why he started selling “soft” drinks. They get it! Really enjoyed the first section and totally understand how some visitors can get totally bored unless I remember who I am talking to and tell the stories the right way!! Now I have to go find the Facebook connection. Thanks, Amy. I am homebound so you are making my days a little brighter. So true ! Thank you Amy for the great reminder! Just in the time for the holidays! I discovered a “gum box” in the Lumberman’s Museum in Patten, Maine with my grandfathers initials carved into the box. He lived in Patten and worked in the woods during the winters. The box was for collecting the dry resin from spruce trees, which was chewed as gum before today’s chewing gum was invented. I told the family about this during a family gathering and after they heard the story about great grandpa’s gum box and what it was used for, I had pre-purchased some and offered it to everyone. Some immediately spit it out, but others enjoyed it and kept chewing. The looks on everyone’s faces as they tried something their ancestors did over 100 years ago, was priceless. Needless to say, they still remember when grandpa told them about spruce gum and then had them try it. How neat is that?! Not only did you share family history, you created a fun memory for everyone there! 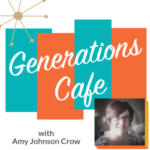 I always enjoy Generations Café…… timely, helpful, interesting. 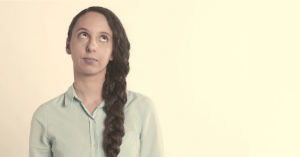 In listening to the podcast, I agree totally with not boring people, but if we are going to talk genealogy can we please say geneAlogy not geneOlogy. There is not an “OL” sound there. True, it is genealOgical as an adjective, but the person is a geneAlogist not a geneOlogist. A pet bug of mine as you can see but well-meaning constructive criticism. When I talk to other people or my dear sister , Pat and other people who has a friend or a family member , who enjoys doing genealogy. During our conversations, someone, mentions their ancestor collected things that was donated to the person who is related to their family name. How many times have we heard how one of their siblings, cousins , who likes or look the same as their great aunt, cousin or they have the same color of eyes and enjoy dancing or etc like one of their ancestors. My dear niece, Cindy has 2 daughters and one son. Here second daughter is Laney and will be 15 years old , December 14th. She is interested in her family ancestors , and is Happy that , I will also learn more ways as Laney learn’s something different, and we will encourage and motivate each other , pursuing genealogy. Great episode on the podcast. Great reminder than not everyone is as enthralled with the hunt as we genealogists are. Thankfully, your #52ancestors prompts have armed me with more stories to share and less research and dates to bore people with! That’s awesome, Mary! I’m glad that the 52 Ancestors challenge has been useful! I think my wife will finally hear a genealogy podcast that she can get behind. Thank you very much for this reminder. I have shared it with our society, Charleston Chapter of the South Carolina Genealogical Society. Merry Christmas! It IS the stories that rivets people and how the story relates to themselves or their lives. That is the key for the average American. Hook ’em with a story and weave in a bit of history and comparison. Also, people love trivia, so that is always good to bear in mind. I did a powerpoint presentation for my family reunion last year. I took the book my grandmother wrote in the 1970’s and researched pictures of the town my great great grandparents were married in, back in Ireland, and compared it with a current picture of the town. I also found a picture of the ship they sailed on and added that. Then put in a vintage picture of the town where they settled in America for a short time and a picture of the mines they worked. The pictures made it more real for my family. I’m currently working on a book to combine all of the above and so much more with my grandmother’s work. Thank you for sharing your knowledge and expertise so generously. Amy: Thank you for this particular session. I am doing a genealogy beginners course in January, 2019 at my JGS in Florida and you helped me to add a few good tips to give the people who will be attending. Great reminders and tips for the upcoming holidays!